Stacksguru address is now stacksguru@appspot.com (in the plural form) remove the old contact (stackguru@appspot.com) and use the new one. StacksGuru is a Jabber/XMPP bot which gives you a command line interface to Stack Apps sites, including Stack Overflow, Server Fault and Super User. The bot allows you to follow questions tags by giving you a notification each time a new question is asked on the followed tag. You can also follow a question which will send you a notification each time someone post a comment or an answer on the question. 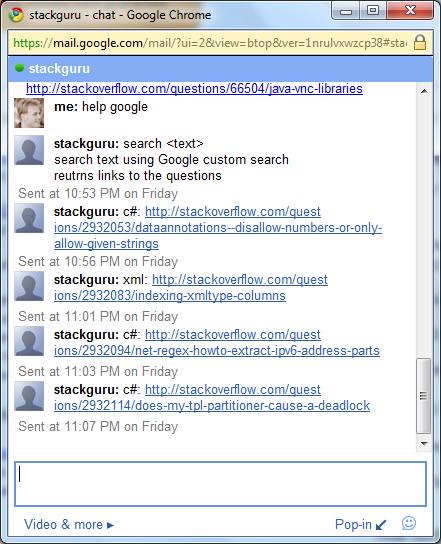 Take your favorite Jabber/XMPP client (Google Talk for example) and add stacksguru@appspot.com as a contact. domain [domain or alias] Set the active domain on which the bot commands will work. For example, domain serverfault will set the default domain to serverfault.com and follow,unfollow and rank commands will work upon the Server Fault API. You can use common aliases (so, sf and su) instead of the full domain names. The default domain is stackoverflow.com in case no domain name is set. follow [tag],[question id],... Start following a question tag or a question. Each time a question is posted with the tag(s) you requested you will get notified. You can follow up to 10 tags. Wildcards are supported (since update 6). You can provide a question id in order to follow a specific question. When following a question you will get notified each time a user posts a comment on the question or if a new answer has been posted for that question. Calling follow without any parameters will return the topics and questions that you're following. unfollow [tag],[question id],... Stop following a question tag or a question. Passing *, all or everything will make you unfollow everything. mute You will get only notifications for question you follow, you will not get any notification for tags you follow. search [free text] Free text search in the titles of Stack Overflow. google [free text] Free text search using a Google custom search engine. This works only on the Stack Overflow domain. rank [user id] Calculates the rank of user id, limited to the top 10000 users. help [command name] Help on a specific command. Written in Python under Google App Engine. You can now follow questions using follow [question id]. When following questions, you will be notified each time a new comment or an answer has been posted on the question. Add the rank command, see where you stand in the race to be in the second place. ALL Stack Apps sites are supported now, you can use the bot to follow question/tags on all Stack Apps sites. The source code of the bot is available on Google Code as promised, enjoy!. Chrome extension! Read more about it here. Wildcards: It wasn't easy, and it required some cool algorithm and four liters of carbonated drinks in order to support following tags using wildcard for example: jquery* will follow both jQuery and jQuery UI. You can put the wildcard at the beginning of the tag or at the end (or both). 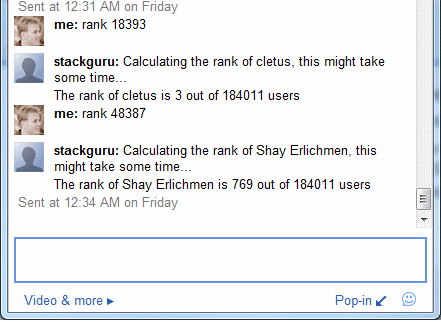 Google has changed the app engine pricing and that forces me to-do some changes to the way StacksGuru works. For starters, tag following will only get you notified if you are currently online, question following will be deleted two weeks after the initial follow. You can always refollow the question or better yet mark the question as favorite and Stack Exchange will let you know once the question has new answers. It's not near real time but it's good enough. The rank command is deprecated - use Stack Exchange leagues instead. Is this app still working? I installed pidgin, added my gtalk account and included stacksguru@appspot.com in the contact list, then I started following the [java] tag, but I'm not getting any alerts even if new java questions are asked. StackGuru is great, I was looking for something like this for months. Still the limitation of 10 tags pe user is far too small, probably I would be interested to have a limit of 100 tags or over. I know that I could install my own instance, but this would take too much time. 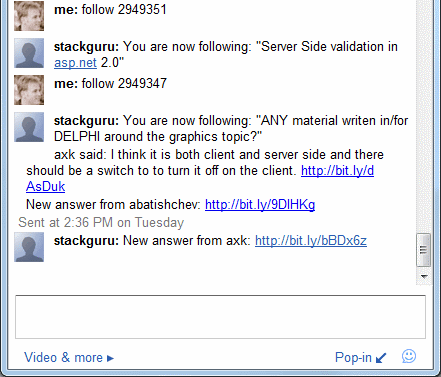 I am not sure if this is a bug with Google Talk but I keep getting messages from stackguru in my inbox while I am offline. Instead I would prefer to get them via the chat client when I became available. Does anyone knows how to tune this? PS. I do not want to disable my chat history because this is very useful feature. Multiple domains? Is it possible to follow multiple domains from one client? I find that would be a useful feature. Is there anyway to use Physics SE with the bot? I tried domain phy,domain phySE etc. None of them worked! Not the answer you're looking for? Browse other questions tagged app chrome-extensions notifier xmpp . Stack Remote - Free Android app dedicated towards Stack Exchange sites!